Moalboal is a small peaceful town approximately a 2.5 hour drive away from the international airport in Mactan. 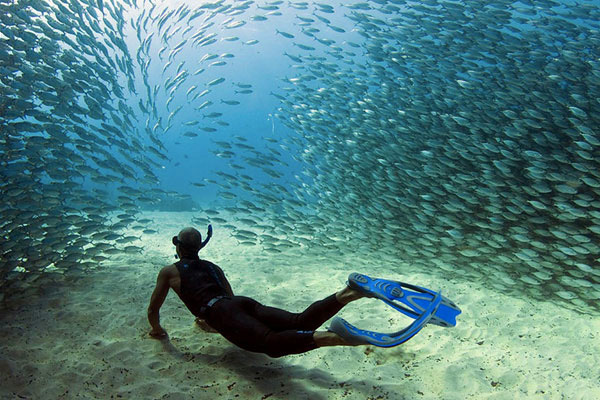 The town does not experience mass-tourism, but regular guests come back year after year for relaxation and diving. The warm waters and rich marine life in Moalboal make it a popular destination for divers from all over the world. Blessed with fringing reefs, Moalboal provides the experience of snorkeling and diving practically anywhere in its waters including the very popular Pescador Island, the "sardine run" off Panagsama beach, and the Tongo/Tuble Marine Sanctuary where possible sightings of sea turtles are common treats. 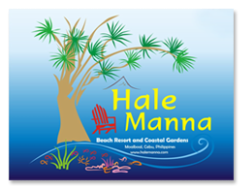 Hale Manna is located in Barangay Bas Daku, Saavedra, southwestern town of Moalboal, in Cebu, Philippines. Getting there entails a 2.5 to 3 hour drive from Cebu City. From Cebu City drive down south via the South Road Properties (SRP), exit in Minglanilla town, then proceed south via the Cebu South Road until you reach Carcar City to cross the mountains to Barili town. From Barili keep driving south until you reach the municipality of Moalboal. 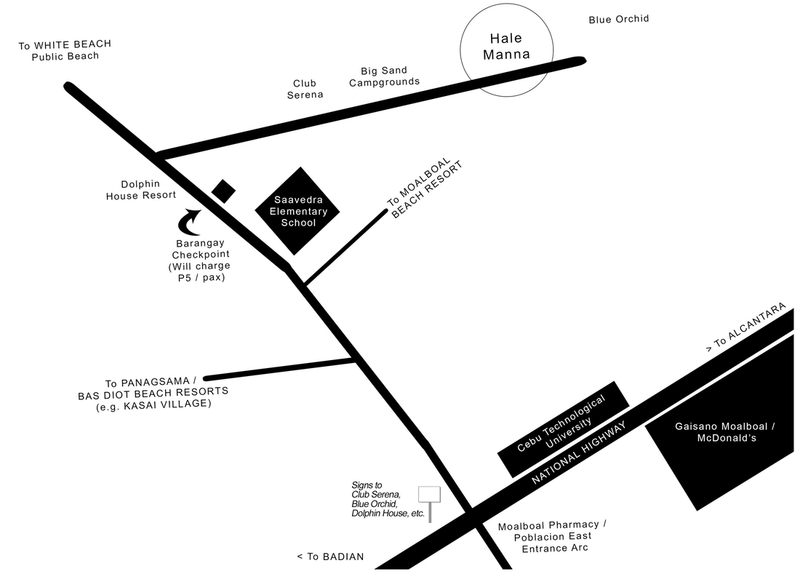 Click here to view the Google Map for route directions. You can get to Moalboal town by taking a provincial bus, or van (v-hire) from the Cebu South Bus Terminal along N.Bacalso Avenue, Cebu City. The most popular and reliable bus transit is currently "Ceres Liner." Upon arrival in the town proper you can then take a tricycle or a motorcycle (locally known as habal-habal) to take you to directly to the resort. Pick-up to and from airport can be arranged upon request. We outsource our transportation to Flamingo Rent-a-Car or California Rent-a-Car with one-way rates at PHP 2,700 for 1 to 4 pax (Sedan), PHP 3,500 for 5 to 12 pax (Van). Round trip rates are P5,400 (Sedan) or P7,000 (Van). Please indicate your request upon inquiry.